Dizziness and Weakness: Should I Be Worried? Dizziness and weakness are complex conditions because there is no one particular cause, so it is often very difficult to pinpoint why they are happening and how to treat them. They can be scary because the sufferer is not sure whether or not they should be worried. The fact is, sometimes dizziness and weakness can be a cause of concern, and other times they are completely harmless. Read on to find out more about dizziness and weakness and when you should worry. 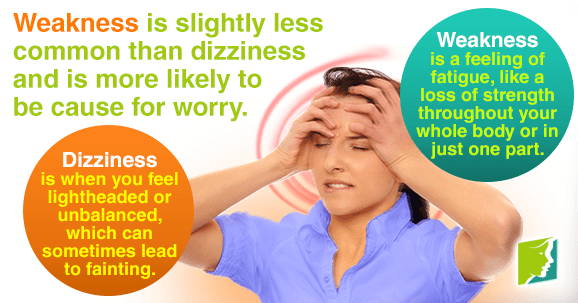 A person is experiencing dizziness when they feel lightheaded or unbalanced, and sometimes it can lead to fainting. Often, this can occur anywhere and so can potentially be quite dangerous - for example, if the person is driving. Even though dizziness can be indicative of something serious, it is most of the time no cause for concern. In fact, for most people, it will only be very occasional, and not dangerous. There is no way to tell from the dizziness itself whether or not to be worried, but an element of common sense should help you; if the dizziness is sudden, severe, or chronic, see a doctor. However, if it happens only when you stand up suddenly and goes away quickly, for example, then there is no need to panic. Weakness is a feeling of fatigue, and the sufferer can experience loss of strength either throughout their whole body or in just one part. It normally only lasts a few seconds and can be followed by fainting. Often, the person finds they cannot move a particular part of their body while the weakness is taking hold. Like with dizziness, it can often mean the sufferer feels unsteady, and they might need to lie down until it passes. The lists of causes above are not exhaustive, but give you some idea of the more common causes of dizziness and weakness. In short, occasional dizziness on its own is rarely a cause for concern, but if it is coupled with weakness, then it should be taken more seriously. Weakness is more of a reason to worry, and if it occurs suddenly, urgent treatment might be needed. Read more about menopausal dizziness.